I was sent this today. 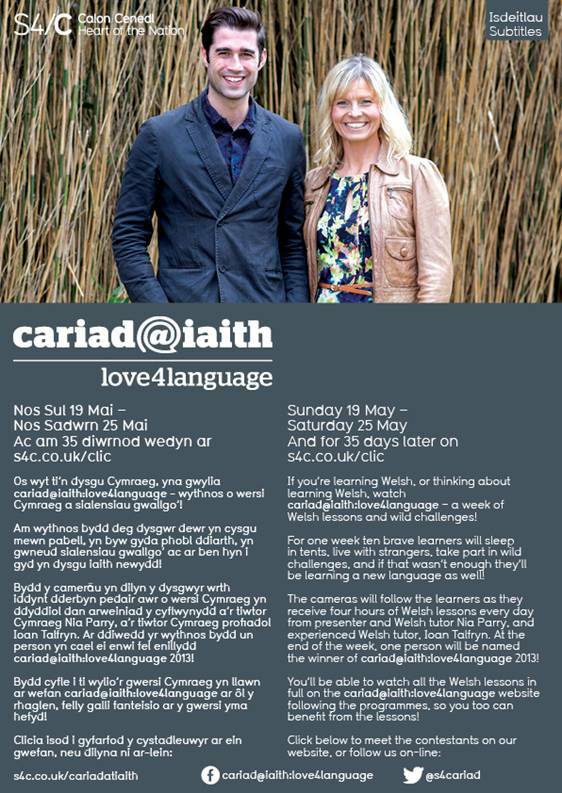 A new series of cariad@iaith (love4language) is starting this Sunday, 19 May 2013 on S4C. It’s a series that follows ten learners of Welsh (for a week), living in tents, being tutored in Welsh, performing challenges and so on. I live near the border and it is raining hard here (the gulf stream has apparently jammed again), so good luck to them! I’ve added Portuguese (as spoken in Portugal rather than Brazil )to SL. There is nice, clear audio and the usual flash-card type games. The new word game can be used with all the phrases. I’ve added and now fixed a new word game on SL, and here is an example in Afrikaans chosen at random. As a programmer I’m good enough and pretty much know what I’m doing, but when learning languages I feel much less certain. I’m writing this as I’ve just finished reading some motivational blogs re language learning to encourage me with my Polish struggles, and it amazes me how confident people are. In real life, I’m quite outgoing, noisy even (maybe hard word if you are uncharitable?). But writing a blog I feel much less confident. I don’t like making definite statements in general and certainly not regarding languages. Life and learning isn’t black and white. There is often no right or wrong but subtleties, nuances and shades (of grey). These shades are interesting. Apparently. I don’t even like making definite statements about programming or running websites – areas in which I feel much more certain and have more experience. There is so often more than one approach to a problem. More than one way to skin a cat and One mans meat is another mans poison sums it up. I like maxims. Pithy and to the point. So, regarding my slow journey with Polish, there is nothing definite, other than it is difficult but rewarding. I’ve been learning Polish since the start of the year. Not full time. I have a family, job, dog, cat (low maintenance), this website and all sorts of activities going on – mainly arranged by my wife. Luckily. Otherwise I wouldn’t do much other than walk the dog. The above are excuses the setting within which I’m learning Polish – or trying to. Ok so where am I? The last time I wrote about this (a month ago?) I decided that I needed to focus on vocabulary acquisition. I learn Polish words and then forget them. I can’t speak for anyone else, and I don’t think I am any worse at language learning than the rest of the world, but I am finding it difficult to retain Polish vocab. What can I say in Polish? I can introduce myself. I can say jestem rolnikiem (I am a farmer), jestem kelnerem (I am a waiter) or jestem studentem (I am a student). So I can almost say what I do!. I can say where I am from ‘jestem z Anglii‘ and so on. So basically I can say a few things but it you were stuck in a lift with me (and only spoke Polish) it would rapidly become boring. But what if one of you can’t? Hmmmm … the risk is too great. I’m about to add audio for the european portuguese pages. Yipee!! I’ve added a new language language learning game to SL. For anyone else, I hope you enjoy using it. If you have any suggestions or improvements let me know. I’m going to spend some time over the next day or so improving, refining, bug fixing and adding this ‘Word Game’ to other areas of the site. I also have audio for the European Portuguese which I will add anon. Our dog was weighed in the vet and discovered to have gained 0.5kg. Not too bad considering how greedy he is, but the vet indicated strongly that he needed to loose it again. He has a graph showing said hounds weight gain and loss over the past years. Update on Polish coming soon ….